I saw myself on the screen the other night. I wasn’t on the jumbotron at the baseball game. I wasn’t starring in a home movie. No, I saw myself in a movie character. And the irony is that it was the antagonist of a movie that I watched years ago. I have become the bad guy. The move was What About Bob? The characters are Bob, a neurotic, psychosis-filled man who stalks his psychiatrist, while on vacation with his family. While the word “stalk” makes it sound like it’s a thriller, it’s actually a comedy, and Bob is very likable. Everyone likes him, except leo, his psychiatrist. Even Leo’s family likes him better. And the reason is that Leo isn’t really that fun. He’s task-oriented to a fault. He’s boring. Everyone enjoys being around Bob. And while watching the movie, I found myself identifying with Leo. I’m very task-oriented. It’s what makes me good at my job and a good provider for my family. I’m very responsible. I’m always thinking of what we need to do next. I take care of things. 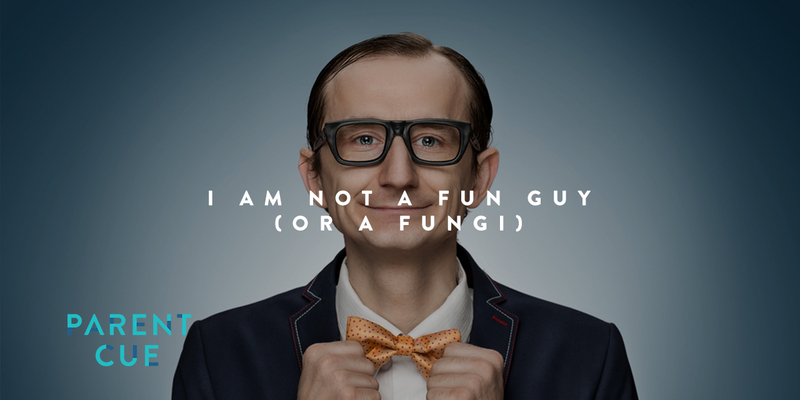 But I’m not very fun. I don’t come up with fun ideas. And when other people have fun ideas, I usually come up with ten reasons why we shouldn’t do it. I’ve never been a thrill seeker. It’s just not part of who I am. I don’t have an exotic bucket list. I just like going to Disney World. And even then, I’m somewhat cautious. I’m not a roller coaster guy, even though I rode Space Mountain with my oldest son last time we were there. We made memories. He has the memory of his dad looking green when he got off the ride and thinking he was going to be sick at any moment. I had the memory of closing my eyes in terror for most the ride, and then of my son laughing at me as we exited. It actually was kind of bonding in an unexpected kind of way. At Parent Cue talk about “fun over time” in parenting, about having fun with your kids. And I have to admit that I really struggle with this one. Most of the fun times for my kids are outsourced with their friends and other families. We have occasional times of fun. Someone says or does something and we laugh about it for years, recounting the story. We have the rare moment of all being together (that’s life with teens) and we play volleyball at my brother’s house at a family cookout. But I’m not good at fun. I’m not sure I’m capable of getting better. I guess to have more fun, it will probably involve me doing a few things I don’t want to do. It will probably involve trying some new things. And it will probably involve some failures. It might also involve letting someone else lead and plan the fun—like one of my boys. And while what we may end up doing may not have the flashiness of some social media posts, it might bring out a type of adventurer in me that looks a little different. I’m not a thrill seeker. But maybe I could use a little more fun. And maybe the fun will come at my expense, as I ineptly stumble my way through some activity. Whatever it takes to make memories.